Oombee Cube is perfect first shape sorter for babies. It teaches shapes and colors, promotes motor skills, and comes with pieces that are attached so that they won’t get lost. This teething and stacking toy in one comes with different textured soft rings that attach together. Playing with different textures promotes sensory exploration and concentration. Stacking the rings helps develop motor skills and the use of both hands together (bilateral coordination). The different aspects of this toy should keep a baby engaged in play for quite some time. MiniSpinny teaches cause and effect, promotes attention, encourages sensory exploration, and helps develop motor skills. It’s also a great travel toy because the pieces are attached and won’t fly away. The Right At Home fabric book is designed to keep kids busy. It comes with pockets and animal pieces for children to place into their correct homes. Playing with this book promotes motor skills, teaches animal names and sounds, and encourages attention and quiet play. Perfect for Travel! Wimzle comes with different textured orb pieces that spin and slide freely in different directions promoting exploration, motor skills, cause and effect, and attention. Zoo Friends hand puppets are perfect for entertaining a child on a long trip and encouraging pretend play and imagination. Kids can also practice putting them on their hands and taking them off (with supervision). Palm-Grip Crayons are designed to fit a toddlers palm to make drawing and scribbling easier. This is great for promoting eye-hand coordination, introducing art supplies, and teaching cause and effect. What's Inside? includes a soft box with different objects in a variety of textures, sounds, and shapes for a child to explore. This toy encourages grasping, motor skills, sensory exploration, attention, and open-ended play. 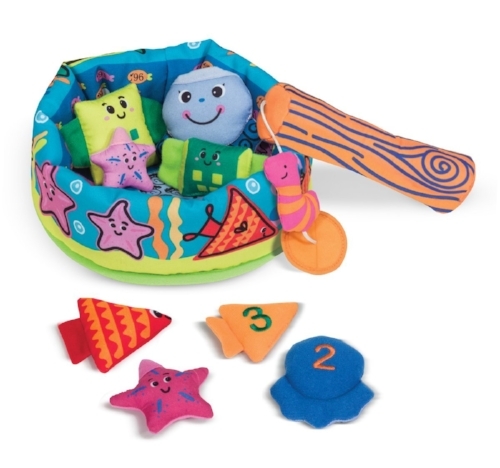 Fish and Count Learning Game includes 8 shaped sea creatures with velcro pieces and a soft fishing rod for little kids to "catch" the fish. This works on sorting, counting, eye-hand coordination, and encourages open-ended play. Tots Sticker Pictures comes with 146 stickers and 6 background scenes. The goal is to peel the stickers and stick them on to the matching scenes. Playing with this encourages the development of eye-hand coordination, fine motor skills, problem-solving, and attention. Take-Along Shape Sorter includes a 2-sided activity bag to practice shape recognition, matching, and coordination all while keeping kids engaged and focused on problem-solving. Buckle Toy "Bingo" Activity Cube comes with 12 different buckles for children to figure out how to open. Playing with buckles works on eye-hand coordination, problem-solving, fine motor skills, and bilateral coordination (using both hands together). Kids love buckles and this will likely keep them engaged, focused, and playing for a while.